Stars and time: two cosmic phenomena that have fascinated man since the dawn of history. The huge progress that has been made in astronomy and timekeeping is symbolized in the moonphase date watch. In 1983, in its workshops in Le Brassus, Blancpain developed the world’s smallest automatic movement incorporating the phases of the moon, the month, the date and the day of the week. When this masterpiece was presented to the world, it enjoyed great success and brought the mechanical watch back to its place in the sun. Today the Blancpain moon-phase timepiece still makes people dream. To celebrate its 20 years of indicating lunar months it has been re-introduced with new features. Its red gold oscillating weight is a face in the form of a crescent moon, engraved and chiselled by hand with the inscription: 20ème anniversaire de la Phase de Lune Blancpain. 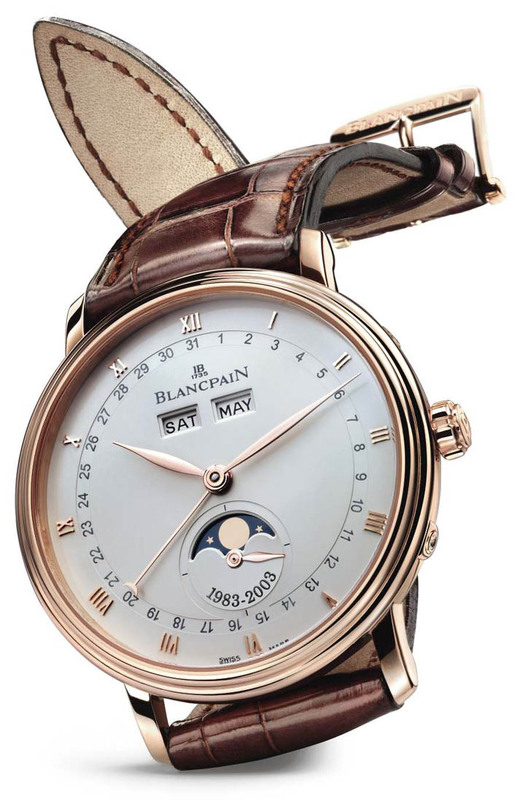 (20th anniversary of the Blancpain moon-phase). The blued steel screws punctuate the movement like a starry constellation and this beautiful commemorative mechanism can be admired through a sapphire window back. The story continues on the face with a reminder of the anniversary, 1983-2003, just below the moon-phase.